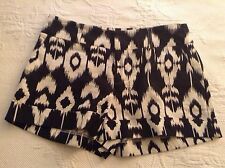 FOREVER 21 Shorts Sz Small Multi color Geometric Polyester/Spandex Pockets . Condition is Pre-owned gently used and in good shape. Shipped with USPS First Class Package. Shell: 90% Cotton, 8% Rayon & 2 % Polyester. W aist: 28". Length: 11.5". Very good used condition. Cotton lace with polyester lining. Zips on left side. Waist measures 28”. Rise is 11” and short inseam. Shipped with USPS First Class Package. FOREVER 21 ~ New! Small ~ BOHO FESTIVAL! Vegan Leather Trim HIGH RISE Shorts. This is a Super Cute Pair of Boho Style Dress Shorts from Forever 21 featuring the Neatest Faux Vegan Leather Piped Trim with a Tulip Cut and a Stretchy Elastized Waist that stretches from 26" to 41". Forever 21 High Rise Denim Shorts Womans Size S Distressed Blue Jean Condition is Pre-owned. Shipped with USPS First Class Package. These are soft cotton material but looks like blue denim shorts. I have tons of cool things! Forever 21 shorts. feels like a spandex material. A little well worn but plenty of life left. they are size small. Has a super cute lemon print all over. Invisible side zipper and clasp. Shorts from Forever 21's Contemporary line. Forever 21 shorts. Black with lace detail. Size small. Measurements (taken with garment laying flat) Waist: 14” (28”) Outseam: 12” Inseam: 2.25” Front rise: 10” Back rise: 14.5” Leg opening: 12” Please feel free to leave me a message if you have any questions. I usually reply within the day. I ship within 24 hours or try within the day depending on the time order is paid. Thank you for considering my item. Size Small. Has 2 traditionally placed Pockets. Silky Liner. 2” Inseam. 2.5” waistband. EUC excellent used condition. Dazz - Navy w white dots. High waist, stretchy dress shorts. Size: Small. Danskin Now - White athletic shorts. Soft cotton blend. Elastic back. Cuff hems. Forever 21 - Denim with lace hem accent.Size 27 US (size 4 Small). Color: Multicolor - Floral. Type: Denim Mini Shorts. FOREVER 21. Material: Cotton. Preowned from a smoke-free, pet-free home. Still in excellent condition - no stains, holes, rips, etc. Ready to ship! Measurements are approximate (rounded to the nearest quarter of an inch)... Waist = 27-28" Rise = 7.5" Inseam = 2" Length = 8.75"
Overalls Shortalls. Acid Washed Distressed Denim. FOREVER 21. Size S / Small. Color Navy Blue. Size Small. Length: 12. Rise: 10.5. Inseam: 2.75. Forever 21 black short shorts. Size small. Worn once. Adorable pair of Forever 21 shorts! Horizontal Stripe. Navy blue and White. Fully Lined. Side Zipper. Forever 21 women’s small yellow and white textured shorts with inside liner. Shorts have zippered side closure but hook at the top is missing, no other flaws on the shorts. Super cute for summer! 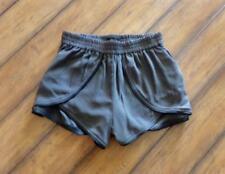 Ladies Army Green 100% Cotton Shorts w/ cuffs. 1.25" leg bottom cuffs. Forever 21. Side seam from waist top to bottom - 11.5". Size Small. Back rise 14.25". 2 back pockets - 2 side pockets.